Download our MyWorkDrive Mapped Drive Client which allows you to securely map a drive to your MyWorkDrive from anywhere for a mapped drive experience with optional Two Factor Authentication support. Visit the Mapped Drive Support Page to download and review best practices when using our Mapped Drive Client. MyWorkDrive provides enterprise file access from anywhere. Access your Work Files without VPN using our Mobile clients for both Android and iOS devices. MyWorkDrive provides direct access to Internal Windows Active Directory based Files Remotely, Collaborate on Documents in Office 365 and Access to Corporate Data with Two Factor security without requiring Sync. MyWorkDrive also allows Office 365 business users to open, edit and save changes to remote Office files accessed through MyWorkDrive using Office mobile apps on iPhones and iPads running iOS 10 or higher and on Android devices running Android KitKat 4.4 or later version and have an ARM-based or Intel x86 processor using the latest versions of Office Mobile apps. Watch the 1 minute video now to see how to add MyWorkDrive Office integration on iOS and Android devices. 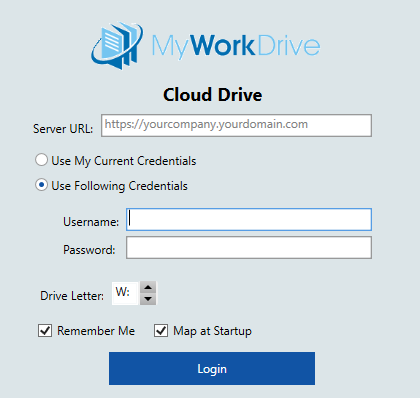 Login to download MyWorkDrive Server Setup or sign-up for a trial.